Gorgeous Table Betty! Thank you so much for inviting us in...I LOVE your silver!!! It's on of my weaknesses! What a beautiful table Betty! Your camelias are stunning and so perfect! this is certainly one of the most exquisite tables I ever saw. 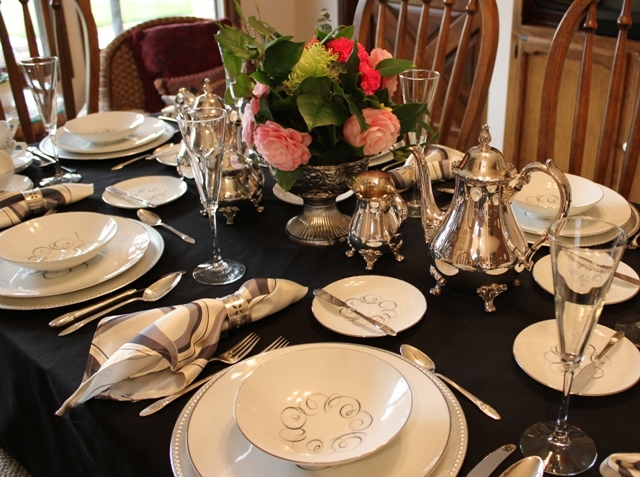 Your silver, the beautiful china and the dreamable Camellias in contrast to the black tablecloth is just a hit. Congratulation to that beautiful table. 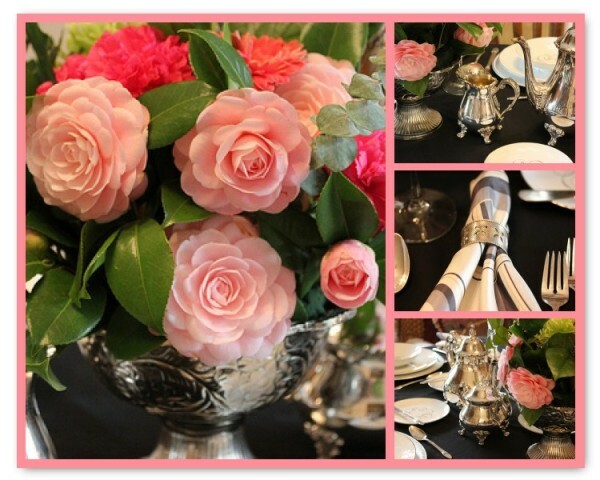 This is so lovely Betty and I think the pop of color in the flowers against the black tablecloth is fabulous! Thank you so much for linking this up to Inspiration Friday this week! What a lovely table. Love your floral arrangement, very well done, and classy! 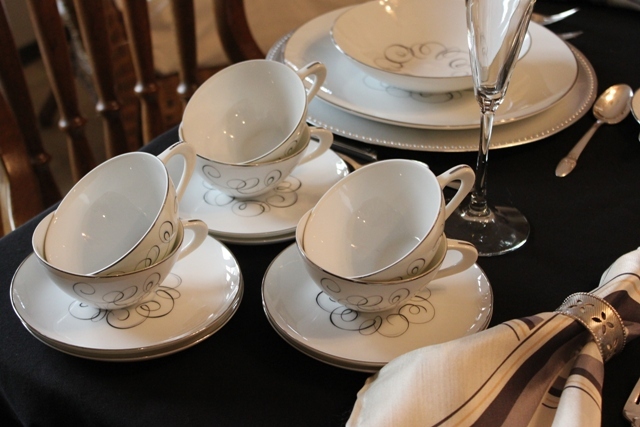 Like your pretty white plates with the designs too, really pretty. Very stunning table. 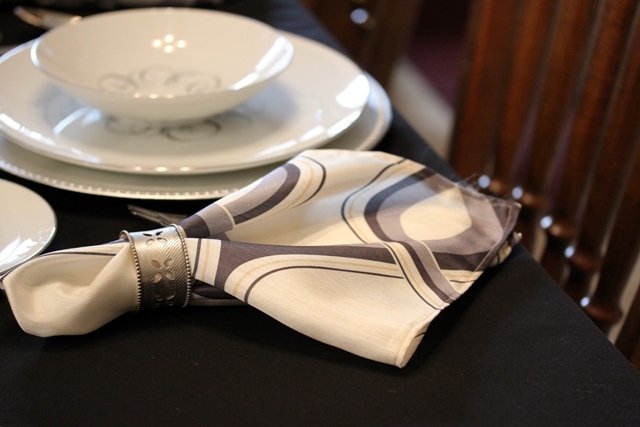 Very pretty...I always use a black tablecloth under all my other linens. I always think it is so rich! Love the table and the photos are sharp and crisp. Your flowers are gorgeous, love the whole thing. 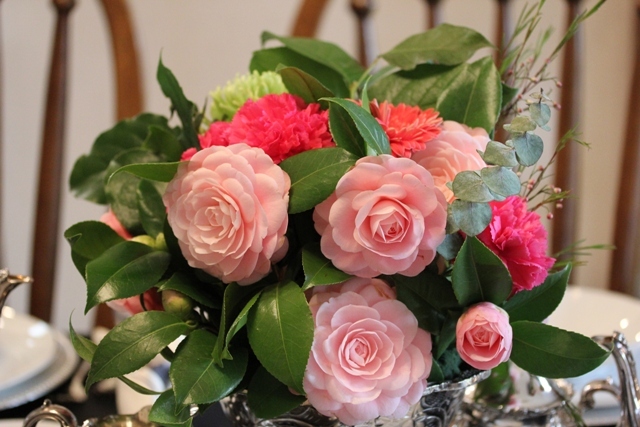 Your camellias are so stunning in your arrangement, love them! 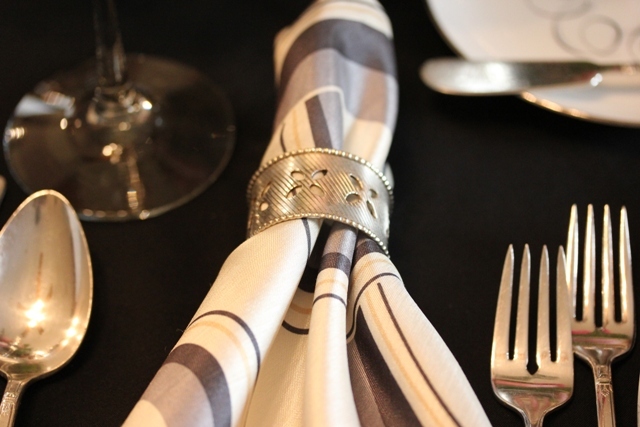 Your table is beautiful and I love all your silver pieces.....stopping by from Decor to Adore! 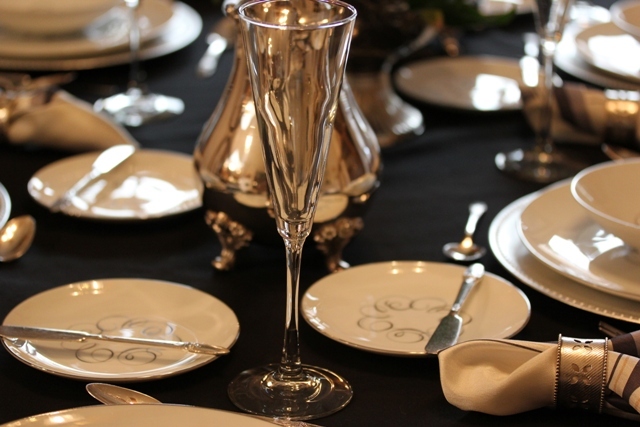 Love the tablescape, very elegant, and of course the gorgeous centerpiece! What a wonderful job you did on this tablescape. Love your post, its so elegant and the flowers are just breath taking. A wonderful job on the phots!!! The color of the flowers is soft and so pretty. Your table is one of the prettiest I have seen. 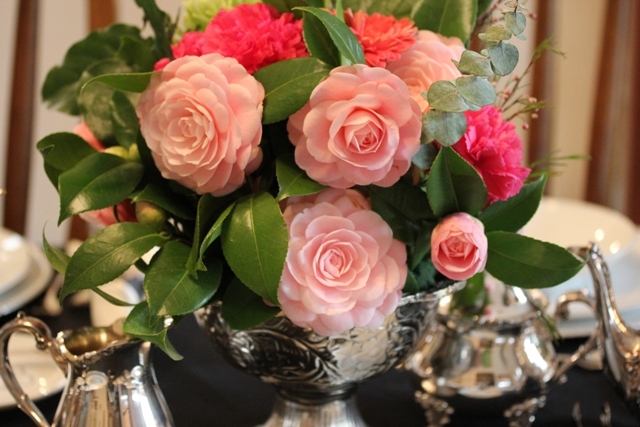 Camilias and silver~ now that is the perfect combination. I am so jealous (in a good way). I can't grow Camilias and I love them!!!! What a pretty table you have set. I LOVE your china. 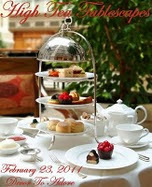 It is perfectly festive for a tea set for a queen! Thank you for sharing this lovely table! Beautiful setting and photos. Love the color of your flowers. I'm a new follower. Just LOVE your china. 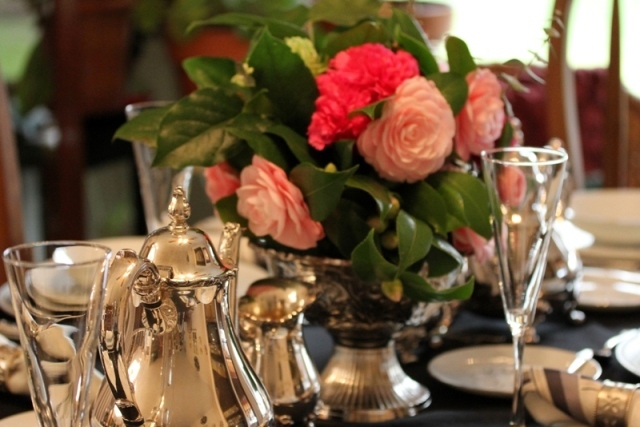 The choice of the black tablecloth was perfect.Your Cammelia's are breathtaking! Oh Betty, what a gorgeous tea party! Everything is just so elegant. 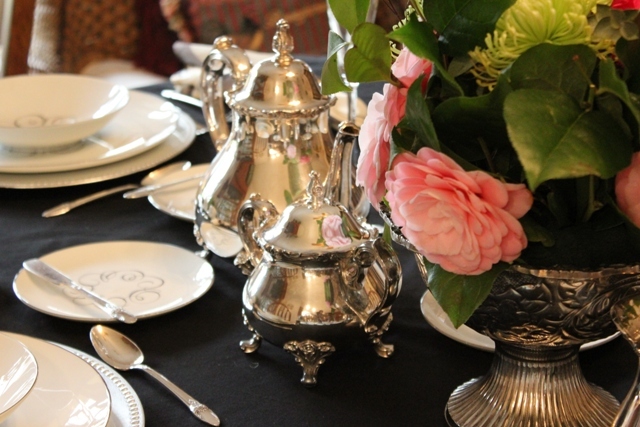 Your silver tea service is beautiful (I've been wanting a set for almost 50 years too, but I still don't have mine!) Your floral arrangement is stunning. Thank you for linking all of this beauty to Favorite Things laurie. Oh I SO love camellia's! 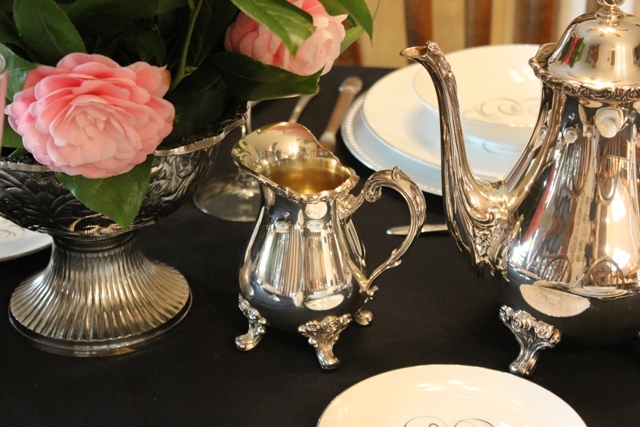 Your silver tea set is just stunning. What a beautiful tablescape.